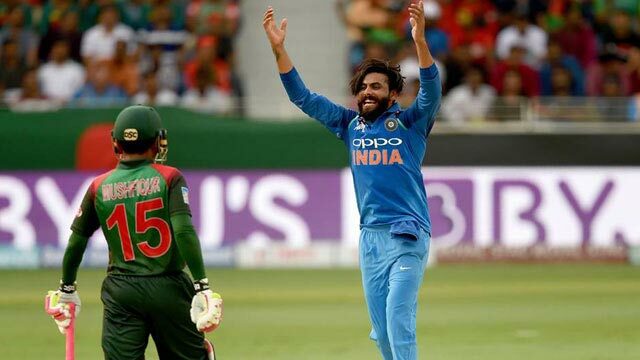 Dhaka, Sep 22 (Just News): Bangladesh's top-order batsmen failed to shine once again, as Ravindra Jadeja's bowling and a commanding fifty from skipper Rohit Sharma led India to a comfortable seven-wicket win in their Asia Cup 2018 Super Four match on Friday. After the Tigers were restricted to 173, Sharma and Shikhar Dhawan made 61 in the opening partnership to set the platform for an easy chase. Dhawan made 40 from 47 balls before being trapped leg before by Shakib Al Hasan and Ambati Rayudu (13) also fell cheaply to Rubel Hossain, but Sharma and MS Dhoni then took the team towards victory. Dhoni hit 33 off 37 balls before giving a catch in a Mashrafe Bin Mortaza delivery while Sharma was not out on 83, made off 104 balls courtesy of five fours and three sixes. Barring a 66-run partnership between Mehidy Hasan Miraz and captain Mashrafe Mortaza, the Tigers would have sufferd a bigger defeat. Winning the toss, Rohit had invited the Tigers to bat first. Both the opening batsmen, Liton Das and Nazmul Hossain Shanto, made only seven runs while Shakib Al Hasan hit 17 off 12 before giving an easy catch. Mushfiqur Rahim added 21 and an unlucky Mahmudullah 25 before he could review an LBW that was wrongly called by the umpire, yet they were seven wickets down with the score on 101. Miraz and Mashrafe then saved the team from a bigger embarrasment, the latter making 26 off 32 with two sixes. The former was the top-scorer for the side, hitting 42 off 50 thanks to two fours and two sixes. Ravindra Jadeja tormented the Bangladesh batsmen the most, bagging four wickets for only 29 runs while Bhuvneshwar Kumar claimed three. After two games in two days, the Tigers will have a day off before they face Afghanistan on Sunday while India take on archrivals Pakistan the same day.